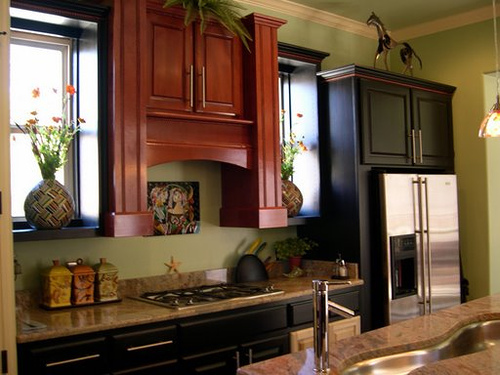 Here is an example of good Interior Decorating in the kitchen. Last month I moved into a new place. I am still opening boxes and putting things away. Settling into a new place takes longer than packing up and moving. Unpacking boxes and placing things where one desires are time-consuming. For me, much has been placed on hold during the unpacking process. I have been dutifully applying Time Management techniques. I am grateful to have learned these throughout my employment history and personal experience. These techniques have lowered my stress level and assisted in the completion of my daily goals. If the new place is designed where you cannot do this, put items as close to their old positions as is possible or place in locations that will serve as “a memory jogger.” Example: If used to having the silverware next to the sink on the right, but you only have drawers across the kitchen next to the stove, place the silverware in the drawer next to the drawer where the kitchen knives and cooking utensils are. Make certain the cooking utensils are conveniently in the drawer next to the stove. This will make them readily accessible while cooking. It is also easier to remember the silverware being in the drawer next to the cooking utensils. These beneficial tips have assisted me in becoming adjusted to my new home’s floor plan. With each passing day, I feel more at home even though the new place was designed in reverse. The only room I have left to finish unpacking and Interior Decorating is my office. May was a month filled with accomplishments; especially around the home. Happy Father’s Day and June to you and your family!